Home / Funny & Comedy / Gist/Gossip / Nigeria / Politics / Categories of wailers. lol! 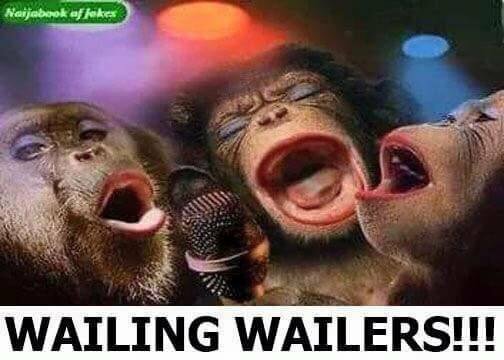 WHO ARE WAILERS. I GROUP THEM INTO EIGHT (8) CATEGORIES. 1. Every public servant who can no longer divert public fund to their private pockets because of the implementation of the TSA. 2. All those who were making money from the ghost workers scam on monthly basis. 3. Those who were feeding fat on Boko Haram insurgency. 4. Federal lawmakers who are no longer given Ghana-Must-Go bags to pass budget, screen ministerial and ambassadorial nominees. 5. Religious and tribal bigots. 6. Some fake Buharist ,who does not understand before joining and are sincerely disappointed that their expectations have not been met,because they think Buharism is an act of the doing things the old ways . 7. Those who don't know what it take to make change in a complex country like Nigeria. 8.Oil marketers looting the country via subsidy.